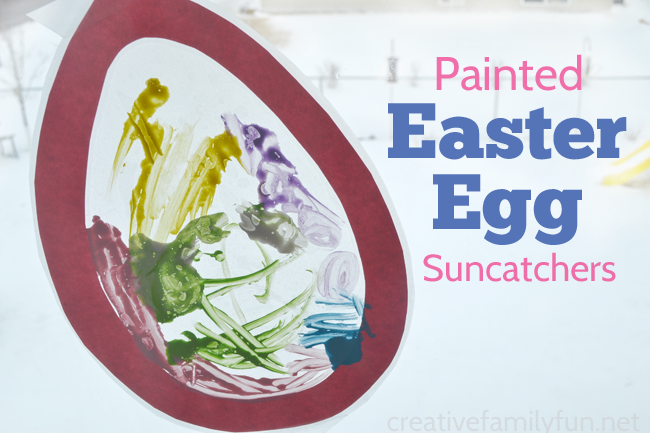 This simple Painted Easter Egg Suncatcher craft is fun to do, easy to prep, and can be adapted for all ages of kids. Get ready to decorate all your windows because your kids won’t want to stop once they get started painting these suncatchers. 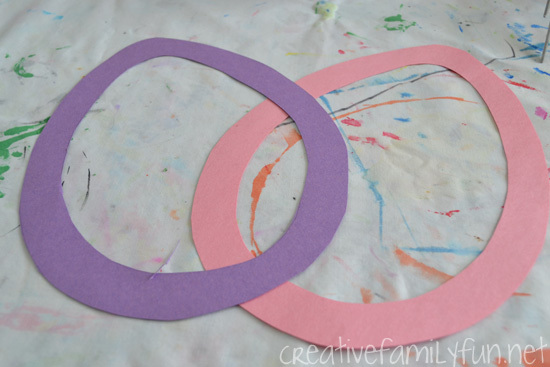 To prep the project, I cut out two Easter egg outlines from the construction paper. I made ours big, using the entire sheet of construction paper. 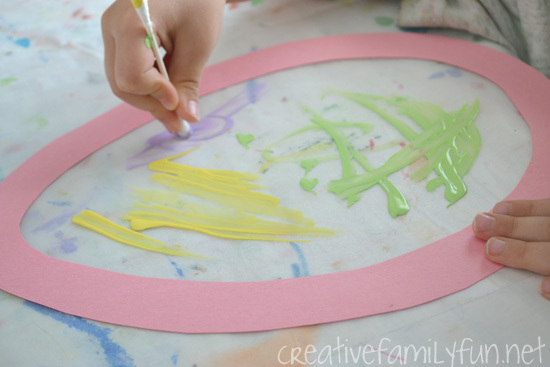 Your older kids can draw and cut out the Easter eggs on their own. You’ll want to do this step for younger ones. I also cut two squares of the Contact Paper for each Easter egg. Cut them slightly bigger than your Easter egg outlines. Next, I peeled the backing off of one square of Contact Paper and placed it sticky-side up on our table. I carefully placed the Easter egg outline on the Contact Paper and then it was time to paint. My preschooler used a cotton swab to paint designs inside the outline. I know you’re wondering what it’s like to paint on the sticky paper. Will your cotton swabs get stuck? 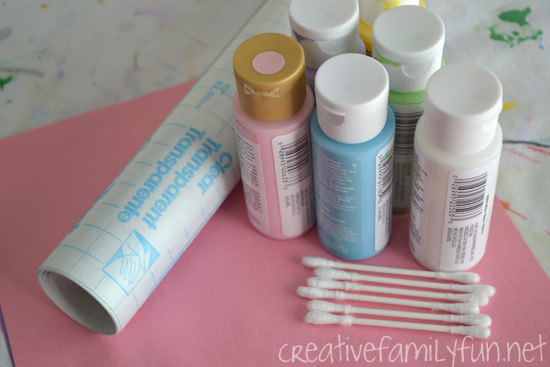 Once you have paint on the end of your cotton swab, it won’t stick to the paper while you are painting. This is the perfect project for dot painting. But, if you’re like my daughter and hate to dot paint, the cotton swab will slide nicely over the sticky paper. It’s not as quick and smooth as regular paper, but you can paint whatever you want on the Easter egg. Once she moved on to our second egg, my daughter was finished with the cotton swabs. Almost every painting project we do lately, turns into a finger painting project. This project was no exception. She started out with a bit of finger painting and soon dived in with full hand smearing. And you know what? 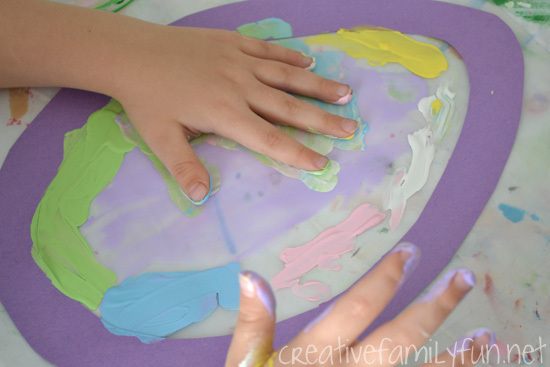 This is the perfect project for finger painting! Once my preschooler was finished painting, I added a second sheet of Contact Paper over the top to completely seal in the paint. Finish the project off by trimming around the edges. You will need to leave about 1/4 inch of Contact Paper around the edge to keep your project sealed. 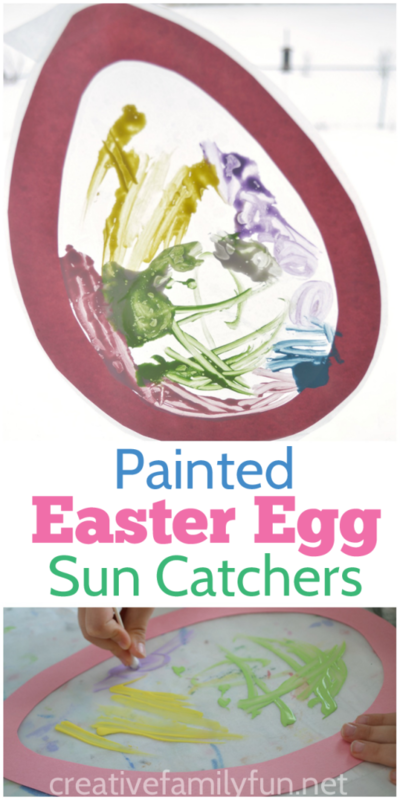 I love this painted Easter Egg Suncatcher project for it’s ease and it’s open-ended aspect. Your kids can paint whatever they like on their eggs. Plus, it can be easily adapted for all ages. Hang them in the window and let the sun shine in. They’re so pretty!